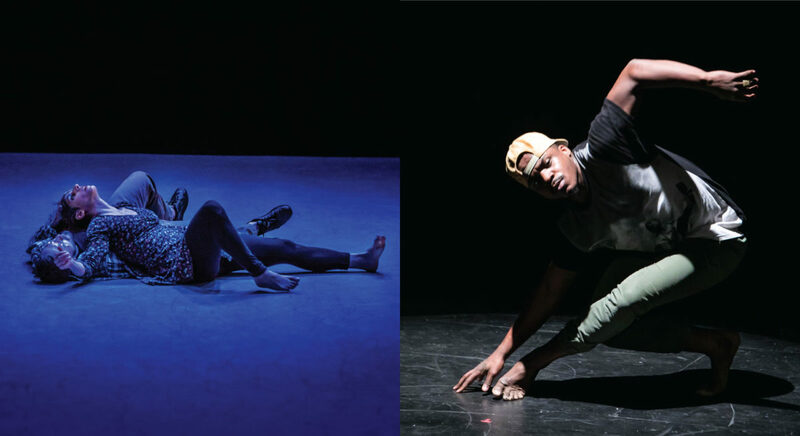 GDC Curated is an outlet for the Gibney Dance Company to present the work of diverse choreographers who share the values of its unique model, viewing dance artists as innovators, generators, and activists. Now in its third annual season, GDC has curated this series prioritizing creators who work with an aesthetic of physical rigor, uncompromising tenacity, and a drive to move the dance field forward. GDC aims to ‘make space’ for entrepreneurial artists who are using their craft to amplify the relevancy of the dance community and position dancers as influential citizens in the world. Lajamartin photo by Bridig Marz; Maleek Washington photo by Marisol Diaz. LAJAMARTIN physical dance theatre was founded by Laja Field and Martin Durov in 2017, they have presented work at Joe’s Pub and SouthSide Arts and Music Festival with DANCENOW, at Westfest NYC, LINK by SALT and BRINE in UT as well as abroad at Newcastle College and GIF 4 in Brussels. LM have been commissioned to create work for Brigham Young University, the J.L Bella Conservatory in Slovakia, Kizuna dance company NYC and the Anton Bruckner International School in Linz, Austria. LM have also had the pleasure of teaching in NYC, SLC, PA, LA, Newcastle, Prague, Slovakia, Brussels and Germany. A native New Yorker from the Bronx, Maleek Washington is a performer, choreographer, and teaching artist. He began his dance training at Harlem School of the Arts, Broadway Dance Cqqqenter, and LaGuardia High School for the Performing Arts, and attended The Boston Conservatory on a full scholarship before beginning his professional career with CityDance Ensemble (Washington DC). While there he worked with Paul Taylor, Kate Weare, and Alex Noeral, and as a SpringBoard Danse (Montreal) participant, Washington also worked with Jose Navas & Rubberband. Upon his return to New York City, Washington collaborated with McArthur Genius awardee, Kyle Abraham, and his company Abraham.In.Motion for four seasons before becoming the first African-American male to perform in the critically acclaimed immersive show Punch Drunk’s Sleep No More. He has also performed for musical sensations, such as Sia, Phish & Rhianna for her immersive AntiDiary Campaign. Washington’s performance and commercial choreographic talent has been recognized nationally at prestigious venues such as The White House, The John F. Kennedy Center for the Performing Arts and Jacob’s Pillow, and internationally in Australia, Jordan, Mexico, and Sweden. In addition to his performance career, Washington is a sought after national and international teaching artist at the Joffrey Ballet School, LaGuardia High School for the Performing Arts, Broadway Dance Center, and Brent Street in Australia. With multidisciplinary, experiential performance works that investigate the people, practices, and spaces shaping Washington’s black identity, he is proud to present his art in 2017 at the Boston Dance Festival, Pepatian and BAAD!, Periapsis Dance and Music Noesis, and at the legendary Movement Research at Judson Church in Spring 2018. Washington is also a 2017-18 Dancing While Black top 10 choreographic finalists. Alongside his creative work, Washington has entered his second season with Camille A. Brown & Dancers in collaboration for her work “Ink” that premiered at the Kennedy Center in December 2017. Recently Maleek was apart of the ensemble for NBC “Jesus christ Superstar” staring John Legend as Jesus. Just finished performing at the 2018 Ted Talk Conference in Vancouver British Columbia in Camille A.Brown “New Second Line”. Performed with ASAP Rocky “Testing” Album release installation at Sotheby’s NYC.